It was a WILD ride as this shower had to be post-poned after it's original date was the morning after hurricane Ike's landfall, so by the time the event was re-scheduled, Carter was days away from arriving! 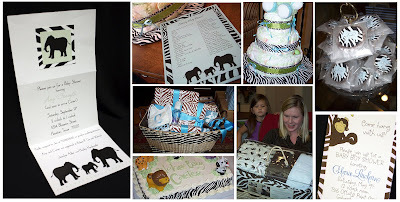 Designed around the Safari theme of the baby bedding; The invitations, shower game, diaper centerpiece, cake and favor labels all incorporated the zebra print and elephants of the nursery decor. Zebra print is a favorite pattern of my own, and is used a lot in my own home and wardrobe! I was especially excited to wrap my gifts to the mommy-to-be in Zebra Patterned Paper! Guests left with the baggies of chocolate McKenzie Cookies adorned with the matching sticker that read "Can't Wait for Carter!" I guess you could say that with the guest of honor, the zebra pattern, the "Pop Culture" Baby names games, and the best cookies in the world...this shower was brimming with some of my very favorite things! Welcome to the Jungle, Baby Carter!